It is from the late Jim Peden - ref A1531. The train seems an important one - it is pulled by a reboilered 'Claughton' and looks quite long so the double track line doesn't seem to be a rural branch! The buildings are wooden and none has a canopy to shelter its passengers, which seems fairly unusual on a main line. The train is from Holyhead and is passing through Rhosneigr on Anglesey. Opened 1907 this late date probably accounts for the unusual buildings. 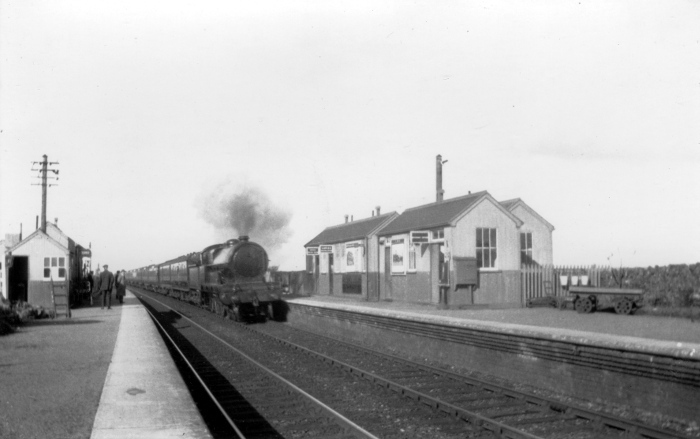 The station was about a mile from the village and with little but open country near. It is the nearest station to Valley Airfield.